Supashen is a multimedia extravaganza in the form of a blog; Sitemeister Chris Shen features content in music, video and text flavours, both self-made and externally sourced. 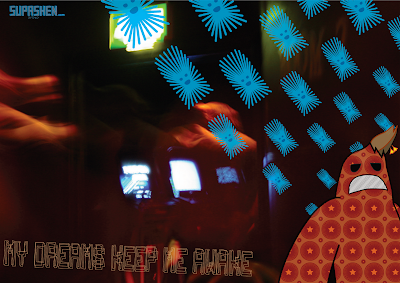 That's one of his mind-bending screensavers above, entitled My Dreams Keep me Awake. Still round the corner there may wait... is a blog from Megan, an Australian, twenty-something psychology graduate "living in Manchester, working in a hotel, wishing I could quit work and walk the earth (you know, like Caine in Kung Fu)." My anger makes me a modern girl is written by a shadowy Mancunian female known only as notmarcie. It's a personal blog. Tony Trehy is a curator and writer and the director of the always-intriguing Text Festival in Bury. The blog focuses mainly on art, his own work and what he's been up to. (Thanks to J for the tip). Hope you feel better soon. It makes blogging tricky if you are effectively temporarily allergic to your computer. Yikes. Can I point you towards a remarkable new personal blog from Old Trafford? The kind of Mancunian experience that we hear far too little of.